You didn’t imagine it. That was a real shaker you felt close to 1:30 this morning. It was a 5.9 magnitude earthquake with a depth of 6.2 miles located 128 miles south, south west of Apia. Residents report that they were awoken from their sleep when they felt windows and doors shaking. One man in Leone said that his whole house shook and their family left their house and moved to higher ground. “It was strong but very short,” said a resident of Nuuuli. She thought she dreamt it until she saw comments on Face Book that there was an earthquake. The National Weather Service said they had a barrage of calls after the tremor from people enquiring about a tsunami. The Pacific Tsunami Warning Center issued a bulletin less than ten minutes after the earthquake that a tsunami was not generated. Homeland Security /Temco was notified by the meteorologist on duty that no tsunami was generated. 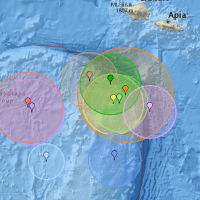 An announcement from DHS.TEMCO issued at 2:00 said the the NOAA Pacific Tsunami Warning Center in Hawaii has confirmed that an earthquake of a 5.9 magnitude occurred south of Upolu Island, Samoa at 1:23 a.m.
Based on available data from the Pacific Tsunami Warning Center (PTWC) there is *“NO TSUNAMI THREAT”* to American Samoa.